The Ozzie kids splash suits are an all in one suit with an integrated hood that keep your children warm and dry in all weathers. 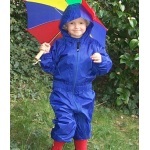 The Ozzie kids waterproof splash suit is great for wearing on walks, playing in puddles and on wet playgrounds. The Ozzie kids lined splash suit also has a soft fleece lining that makes it really warm and cosy for your little one in colder weather. Like any small child, our daughter is attracted to water like a magnet and loves to play in puddles and even in the rain. We have found our splash suits to be absolutely essential! We had four main requirements for a splash suit. The Ozzie kids splash suits fulfilled all of these criteria. We love that the Ozzie kids lined splash suit has a soft microfleece lining, which means I don't have to worry about our child being cold even in the snow or on longer outings. The full length zip and elasticated cuffs and bottoms make it easy to get her dressed. Our daughter is not very cooperative about putting on her coat, but it is easy to put this splash suit on and then zip it all the way up so she is ready to go in no time. I also find it very useful that it has a hood. I love being able to take her to the playground when it is raining and no one else is there. She can go on the swings and the slide and it doesn't matter at all that its wet outside when she's warm and dry inside her splash suit. 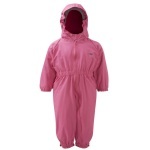 We also have the Ozzie kids waterproof unlined splash suit, which is great in warmer weather. It provides great protection for those April showers that now seem to occur during any month! 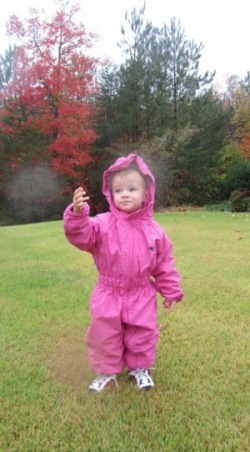 Our Ozzie kids splash suit came in particularly useful recently as we were in Washington DC during the hurricane Sandy. Before the winds really picked up, we decided to go outside briefly to take a look at the brewing storm. We put our daughter in her lined splash suit and I wished we had one in my size too! She was warm and dry as we walked around the block in the blustery rain and played with the falling leaves. After the storm had passed, everything was incredibly wet after more than 5 inches of rain had fallen in two days. I put her in the splash suit and we walked to the local park and played in the puddles together. We had a very happy little child! We really put our Ozzie kids splash suits to the test and they passed with flying colours! 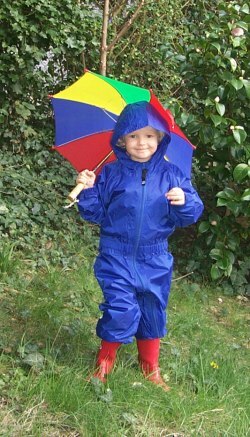 An all in one splash suit is essential for active, young children. These waterproof and lined splash suits are soft, comfortable and keep kids warm and dry so they can enjoy the great outdoors in all weathers.